Adam: This is AM Property Management Episode 3 and this is the Investment Property episode. So, essentially when Mike and I started our company a couple of years ago and purchased Atrium, one of our goals by year two was to own an investment property together. We’re both big believers in “what you put out there is what you get, so it’s been weighing on our mind heavily”. We actually found a property and we’re getting ready to close on that property on December 31st, 2016. So, we met our requirement of two years of what we wanted to find. More importantly when you’re looking for an investment property, it’s not about just buying one, but it’s about buying a good one. So, we’ve looked at some over the past two years but they didn’t make sense for us. We’ve ended up finding a smaller property just to get the momentum going for what we’re trying to do. Mike, why don’t you tell them a little bit about the property that we got and why we’re getting it. Mike: So, one of our owners that we manage properties for had other properties. She owned this property and she and I went over to take a look at it because she was asking me for help with vendors on either getting the property ready to re-rent or sell. So, I started to take a look at what she bought the property for back a few years ago when she purchased it. Adam and I then went back to her and made an offer. It worked out well for both of us. Adam: Even more than that, Mike was not looking for this deal, but he was pretty smart in calling me up since I hadn’t seen the property. He called me and said “this is one that we could get a pretty good deal on, let’s go ahead and make a run at it”. So, we went over and took a look at it. When you look at it, it’s not the most beautiful thing in the world, but one thing about being in property management is that we’re looking at hundreds of properties a year and we know what we can do. We renovate a huge number of properties and it’s actually nice when we see one that’s not in good shape because we know about how much it will cost to get it renovated. So, for us, this was a great first project to get the ball rolling. Mike: Yep, so we both went over to look at the property together and made an offer. It just made sense. We’re going to end up buying it for sixty thousand dollars and we’ll end up renting it out for one thousand dollars per month. So it should cash flow pretty well even from month one. Adam: Yeah, we’re actually going to take debt on this property. I’m a big fan of obviously not going over 80% LTV on a project. But, we got this at such a good deal and when we put the money into renovate it we’ll be at an even better LTV. The debt is not very much, so the payment is four hundred dollars to five hundred dollars a month, all in with taxes and insurance. We should rent it for one thousand to eleven hundred a month. So, it’s a small deal but we’ll clear five to six hundred dollars per month. So, if you’re looking at six hundred dollars per month, you’re looking at a twenty-four percent return on cash. So, it’s a little deal, but it’s actually an exciting deal. One of the things I really believe in is that it’s great to have the rental income, but I love when you sell the property in ten or fifteen years and that little property that was worth sixty is now worth one hundred and thirty. So, our goal, and whether you’re going through this with a partner or yourself, is we want to find properties that cash-flow really strong and properties that we can hold on to for a long time. Our goal is to take the income, so if we make five or six hundred dollars, that we roll it back into the operating account and keep building up that equity so we can buy another property with that money. So, all of the investment properties that I have, I take zero dollars out of those properties. We either pay back investors or we put money in the account to start buying other properties. At our age, it’s not a necessity to live off of this money. It’s more of a necessity to see how much we can grow the capital. Mike: So, one of the things that Adam and I talked about at the beginning of the year is how do we get our employees involved. We really believe in what we do. We both believe in real estate, but this is actually the first deal that I’ve actually been involved in, in terms of an investment property even though I’ve been in property management for a while now. I’m super jacked about being a landlord and a property owner but I want to get the team involved. Adam came up with the idea of instead of just giving year-end bonuses, maybe we give year-end bonuses that actually have equity in a property. He came up with this cool idea on how to do that and how to structure it. I’ll let him go over what it was, but he set the goal in place at the beginning of the year and it’s cool to see it come to fruition. Adam: It’s something that we put out there. One of the things that Mike and I really want to happen for our employees, is that at the end of this thirty to forty year run, they’ve actually accumulated wealth themselves. I always say that nobody is getting rich working for anybody. Mike and I will never become rich just working for Atrium alone. You really make your money at what you do from five pm to midnight. We want to get our employees involved in that, so we created a program so that instead of taking a year-end bonus or a year-end cash, they can take the money that we were going to give them and put it into this property and we’ll match their equity. We’ll create an operating agreement and show them how an actual investment works so that they can be a part of the process. The most important thing at the end of this is that when they’re retiring, their family now has assets. This is one property and we wanted to do it by the end of the year and create this program. It’s nice when companies have 401Ks but since we’re a property management company, our employees should be managing property and managing their own property. They can choose not to do it, but with this property and everybody that chooses to do it, we’ll all have stake in a property that we manage. I think that helps with our owners and it helps them in dealing with our owners because they now know the things that an owner is looking for. Rather than just scheduling a vendor to come out, pay them, and have them say ok let’s get it done, they are now going to start to think “can I get that cheaper” or “is there a way I can help you increase the value of this property for the owner”. And you never really know how to do that until you’re doing it for yourself. So I’m really excited about this program for our employees I think it’s amazing and I tell Mike all that time that the best statistic I’ve ever heard is about Warren Buffet’s secretary, how she’s a millionaire at this point. I really think that after thirty, forty, fifty years after we’re done, if our employees didn’t get anything after this then there was no point. We want to attract people to our organization that want to be investors because this is what we do. I think this is a great way to show that this is what we’re doing and you can be a part of this. It’s not something that they have to put a ton of money into, it’s more about the process. Mike: So, that’s it. Year two in business, we made our goal and got our first investment property. We’re super excited about this employee program. 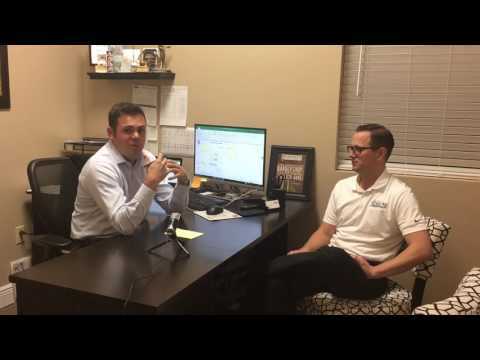 If you have any questions about how to acquire a property, Adam has a background in banking and obviously knows a lot about this topic. Adam: We love looking at deals, so send them our way and we can take a look and assess what you can make as far as return. Thank you!